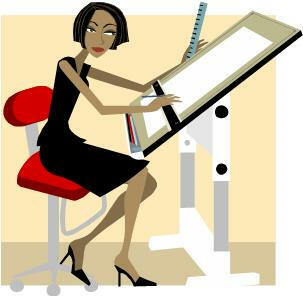 December 21, 2009 (DURHAM, NC) — Women make up half of all students in American graduate schools of architecture today, according to a New York Times report, and roughly 20 percent of the profession, according to the American Institute of Architects. That was not the case from the 1940s through the 1970s. In 1975, women represented only 1.2 percent of the profession. Design schools were heavily dominated by men through those decades, as were architecture firms, most of whom only allowed women in their offices as secretaries, if at all. “As with most professional jobs in the 20th century, architecture and construction was just for men. With few exceptions, like wartime, it was often incredibly difficult for women get trained and hired. It was ‘Mad Men’ for real,” Smart said. — Mary Olive Johnson, a Fuquay-Varina, NC, native who graduated from the NCSU School of Design in 1969. She worked for Odell Associates in Charlotte and says of that experience, “They gave me every opportunity imaginable – except that women were not allowed to go out on the job sites.” She left architecture in 1985 to work in the nonprofit sector for the YWCA and Habitat for Humanity. — Constance Grottola Mitchell, who transferred into the all-male architecture program at Catholic University in Washington, DC, in 1956. As a member of what is now Calloway Johnson Moore and West in Winston-Salem, NC, she worked on the restoration of the Municipal Building in Asheville and the main administrative building at the NC School for the Deaf in Morganton, NC. — Anne Kathleen Tennent, a graduate of Canterbury College (now Kent College) who came to Salisbury, NC, in 1958 as part of a sister cities exchange program with Salisbury, England. She and her husband, Douglas Tennant, worked for John Ramsay, FAIA, of Salisbury before forming their own firm, Tennent & Tennent Architects. — Dorothy Morton Abernethy, a Raleigh native and the third woman to graduate in architecture from the NCSU School of Design. After working at Colonial Williamsburg and with the National Park Service, she returned to NCSU to study horticulture. She now works for the Blue Ridge Parkway in Asheville. — Margaret King Hunter (1919-1997), a member of the first class of women architects at the Harvard School of Design in 1942. She and her husband, architect Edgar Hunter, authored books, taught and designed buildings for Dartmouth College, and relocated to Raleigh from New Hampshire in 1966. She was the third woman to be registered as an architect in North Carolina. — Georgian Pope Yeatman (1902-1982), an English immigrant and the very first woman to be registered as an architect in North Carolina. She was initially denied graduation at the University of Pennsylvania because the university refused to issue an architecture degree to a woman. She received her architecture degree instead from the Massachusetts Institute of Technology in 1925 and moved to Beaufort NC. By the 1960s she became one of North Carolina’s largest farm owners. Smart invites suggestions on other women architects and designers who worked in North Carolina before 1970 at george@trianglemodernisthouses.com. To read the current profiles, go to www.trianglemodernisthousescom/ncwomen.htm. Triangle Modernist Archive, Inc. (TMA) is a North Carolina nonprofit organization committed to preserving, restoring, and growing modernist architecture. Our primary public service is Triangle Modernist Houses (TMH), an award-winning, nonprofit educational archive for modernist residential design. TMH also hosts popular modernist house tours, design films, and trips several times a year, giving the public access to the Triangle’s most exciting residential architecture, past and present. These events raise awareness and help preserve these works of art for future generations. For more information visit www.trianglemodernisthouses.com.